A crisp cold magical morning to climb Roseberry. 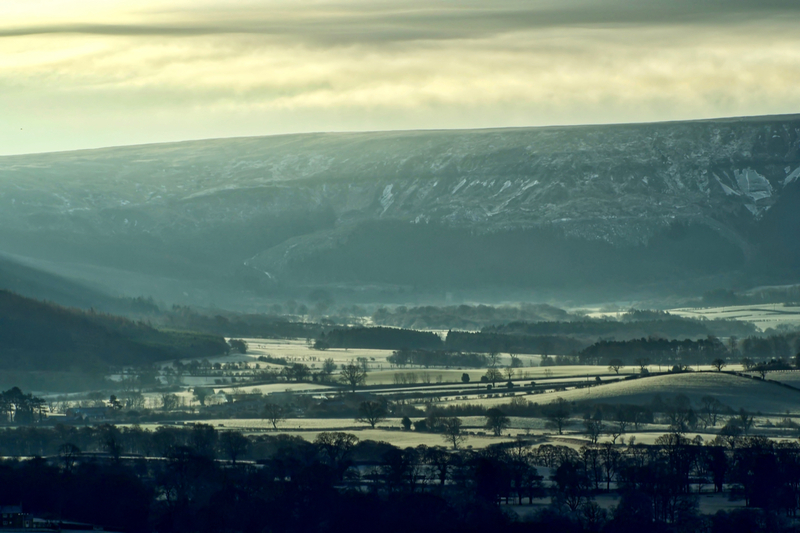 Fleeting breaks in the clouds allow the winter sun to reveal the frosty fields of Greenhow Bottom. Sometimes mapped as Greenhow Botton, the name derives from the Old Norse ‘botn‘ meaning a bottom or depth such as the innermost recesses of a dale. The oldest Ordnance Survey map also names the area as Greenhow Burton. I like to try and identify specific features on a general photograph but I have found this particularly hard. I think the slightly raised ground on the right is Stone Stoup Hill between Ingleby and Battersby. Interestingly the same old OS map refers to this “hill” as Farnsides, a name which is Anglo-Saxon in origin, ‘fernes‘ meaning a wilderness.